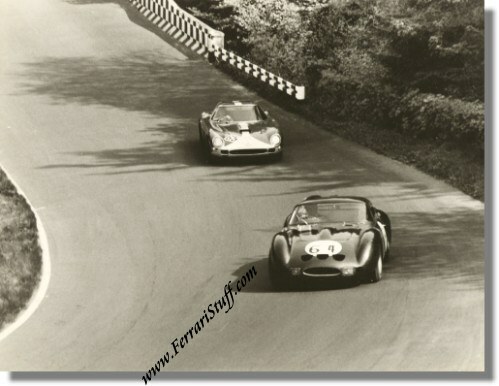 Vintage 1965 photo of Ferrari 250 GTO S/N 4491GT and 250 GTO 64 S/N 4399GT - 1000 KM Nurburgring. This is a vintage photo of TWO Ferrari's GTO in ONE shot! It was taken during the 1965 1000KM race at the Nurburgring and shows the # 64 Ferrari 250 GTO (S/N 4491) of Peter Sutcliffe which he shared with "Lumsden" for this race and who made it to first-in-class and 15th overall and the # 65 Ferrari 250 GTO 64 (S/N 4399) of Gordon Durham which was raced by Salmon / Kerrison and who were forced to retire with engine trouble. S/N 4399GT started its life as a "normal" 250 GTO and was rebodied to "64" shape in late 1963 by Scaglietti. It seems to reside in the UK nowadays. S/N 4491GT also started out as a normal 250 GTO and was originally owned by David Piper who had the roofline and windscreen lowered which is clearly visible in this picture. It was changed back to a standard 250 GTO roofline by its current owner in the early 1980's. It now seems to reside in Italy. The photo measures some 24 x 18 cm or 9 x 7 inches.